Galena Village Council member Dave Simmons is a local history aficionado who is retired from the Ohio Historical Society, where he works part time as senior editor of the popular history journal Timeline. He has been part of the advisers and writers for multiple statewide historic bridge surveys conducted by the Ohio Department of Transportation and has received several national writing awards from the Society for Industrial Archaeology. Simmons also is president of the Ohio Historic Bridge Association, and could likely tell you the location of every covered bridge in Delaware County’s earlier days. During the Tuesday Big Walnut Area Historical Society meeting at the Myers Inn Museum in Sunbury, Simmons will speak about covered bridges in China, and a Sisters Bridge agreement with a covered bridge in Ohio. 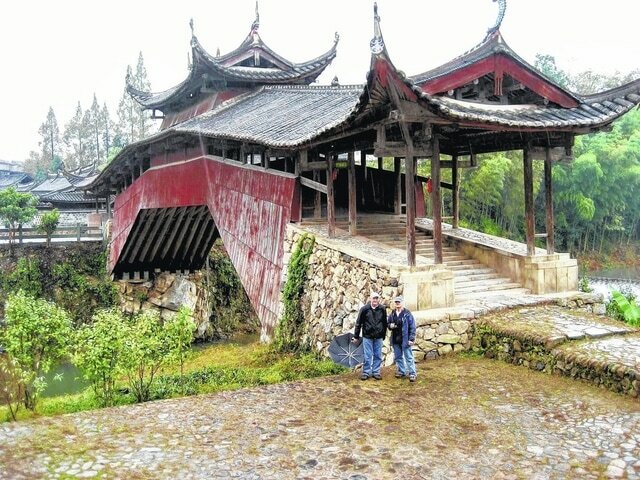 Simmons was invited to the fifth annual China Taishun Covered Bridge Culture Tourism Festival in November 2013 in Taishun County, Zhejiang Province, China. The goal of the festival was to promote tourism in the remote, mountainous part of southeastern China. While in China, Simmons signed the Sister Bridges agreement in which a covered bridge in Taishun County and a covered bridge in Ohio were informally connected. The background and meaning of the agreement will be the main topic of his talk. The historical society meeting begins at 7:30 p.m. in the Myers Inn meeting room. The talk is free to the public. The Myers Inn Museum is at 45 S. Columbus St. The museum is open from noon to 3 p.m. Thursdays, Fridays and Sundays, and from 10 a.m. to 3 p.m. Saturdays. Admission is by donation. To learn more about the Big Walnut Area Historical Society and the Myers Inn Museum visit BigWalnutHistory.org or phone 740-965-1154.